Impressive though it may be, Google's search engine is still in its infancy according to head of search Amit Singhal. Speaking extensively with The Osbserver, Singhal explained that even Google is amazed at how far search has come in the past ten years, but that the best is yet to come. Pointing to his childhood love of Star Trek as inspiration, Singhal said, "I deeply believe now that shaped my thinking. "The fascination with flying through galaxies and talking to a computer that could answer any question was always there for me. But of course I never imagined those problems would begin to be solved in my lifetime at all." Then he whips out his phone and asks Google - using his voice - what the population of London is, and how tall Justin Bieber is. And Google - using voice - answers. Talking about Google's fledgling Knowledge Graph, he explains that the search engine needs to know loads to answer even those simple queries - it needed to understand that Justin Bieber is a person, what tallness is, what metric to answer in and, of course, where to get that information from a reliable source. So instead of just delivering a list of pages that mention the words you're looking for, Google Search has, in Singhal's words, "begun to learn how to understand the real world of people, places and things". "Nuance," he added, "is what makes us human." But it doesn't exactly play nice with machines' black-and-white processes. Having all this precise information literally at our fingertips isn't making us Google any more accurately; we're getting lazy, says Singhal: "The more accurate the machine gets, the lazier the questions become. So actually our lives get harder." Poor Google. Anyway, we're sure it'll be fine. 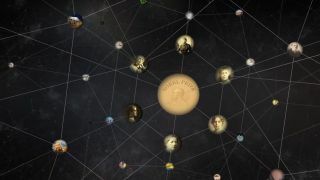 The Knowledge Graph, which was launched in May 2012, aims to provide you with more answers than simply links to pages and Google's dream is to "reduce every possible friction point between [the user], their thoughts and the information they want to find." To this end, it now puts every search through over 570 million references, with 18 billion factual connections between them - all to help you find out how tall Justin Bieber is. He's 1.7m tall, by the way.